Select Copy Contact from the Edit menu to copy the contact's name, company, and primary address, email and phone to the clipboard. Following is an example of the info copied to the clipboard when choosing the Copy Contact command. Most of the field labels in the Info Panel contain a Copy command. 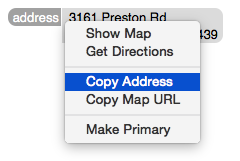 For example, you can copy a mailing address by clicking on the address field label and chossing Copy Address. You can disable the hover links in the Info Panel by holding down the Command-key while hovering over a field. You can then select the text and Copy it to the clipboard.